Effectiveness for 24h, against odors and perspiration, in the first hypoallergenic deodorant with stone of alúmen. 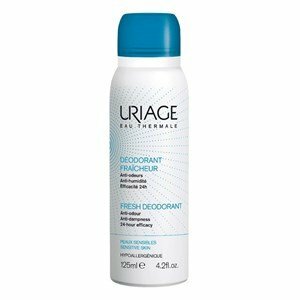 Deodorant Fraicheur Uriage quickly and effectively absorbs humidity, for a silky and comfortable result, thanks to its composition with stone of alúmen, a powerful anti-bacterial agent, anti-odor and astringent. Freshness and hygiene in a pleasantly scented care for an extended protection. Vaporize at 15 cm of the armpits. No aluminum salts. Without alcohol or parabens. When the skin is sensitive or reactive (ex: post waxing) and at the same time has severe sweating, there is a need of an anti-perspirant associated with a soothing, healing, anti-inflammatory and moisturizing component. The ideal? A care with Uriage thermal Water.